WASHINGTON POST: The Purple Line can do with a few less station elevators, shorter platform lengths and no environmentally friendly plant material for track beds at all, according to a list of $210 million in cost reductions identified by Maryland Gov. Larry Hogan (R). The list of potential cuts — 43 items in all — was sent to Montgomery and Prince George’s county officials last week and released by Hogan’s office late Monday. 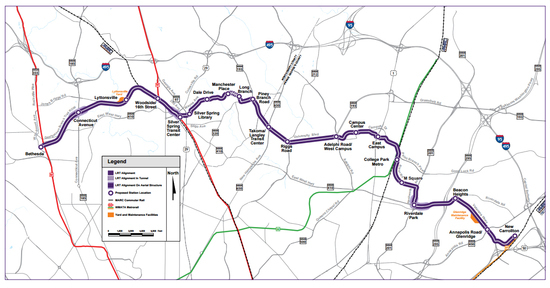 It includes one reduction already mentioned by the state: cutting service frequency from six to 7.5 minutes.... Hogan’s conditions for greenlighting the project also include a deep reduction in the state’s financial commitment, from $700 million to $168 million, and increased payments from Montgomery and Prince George’s counties — possibly as much as another $50 million each. Even before Mr. Hogan’s statement lawmakers in that state had begun efforts to remove the plates. On Monday, state Sen. Jamie Raskin and Delegate David Moon, both Democrats representing the Washington, D.C., suburb of Takoma Park, asked the state attorney general whether the Confederate emblem could be removed by administrative action without requiring new legislation. WTOP: "Starting in October of next year, Montgomery County businesses will have to give up to seven days of paid sick leave to workers. Businesses with five or fewer workers would have to give up to four paid days off when an employee is sick. Supporters say there’s momentum to get a statewide bill passed. 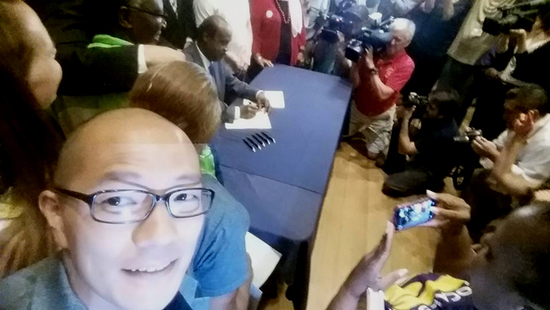 The bill-signing ceremony in Silver Spring was attended by U.S. Secretary of Labor Tom Perez, who told a packed auditorium at the Civic Center there that there’s more work to be done...."
We had a great gathering of justice advocates last month. See you at the next one! P.S. I post more regular updates on my Facebook page - Please follow me on Facebook.